The Woodrow Wilson International Center for Scholars has invited Srebrenica genocide denier and a close friend of an indicted war criminal to preside over an important public event. Srebrenica genocide claimed at least 8,106 and up to 10,000 lives - many of them children. Thousands of women were forcibly expelled (ethnically cleansed), while many women were violently raped. Here we present information about the outraged reactions in Bosnia-Herzegovina and elsewhere in the world at the decision by the well regarded Woodrow Wilson International Center for Scholars to invite a Srebrenica genocide denier Alexandros Lykourezos to chair an important public event in Athens, Greece. Alexandros Lykourezos a prominent friend and supporter of an indicted war criminal and a mastermind of Srebrenica Genocide - former Serb General Ratko Mladic. PHOTO CAPTION: Srebrenica genocide denier Alexandros Lykourezos (in white shirt) shakes hands with a mastermind of Srebrenica genocide, his close friend and a former Serb Gen Ratko Mladic. Ratko Mladic is an indicted war criminal and a fugitive from the international justice. Lykourezos' Greek company web site is located at Lykourezos Law Offices. VIDEO: Srebrenica genocide denier Alexandros Lykourezos. (For further information and to express support, contact Jasmina Burdzovic Andreas at Jasmina_Burdzovic_Andreas@brown.edu ). I am writing this letter to express both my astonishment and my disappointment concerning your selection of Mr Alexandros Lykourezos as the dinner chair for the presentation of the Woodrow Wilson Award for Public Service to His All Holiness Ecumenical Patriarch Bartholomew I in Athens later this Spring. Even though Mr Lykourezos's function here is minimal, it is nevertheless under the auspices of a respected United States governmental institution - The Wilson Center. Thus, it came as a shock to see Mr Lykourezos - a defense lawyer and self-described 'friend' of an indicted war criminal, the Serb General Ratko Mladic (1) and a denier of the internationally recognized Srebrenica genocide (2) - being in any capacity affiliated with the Woodrow Wilson Center. For the sake of international justice and your institution's reputation, I beg you to reconsider your decision to involve Mr Lykourezos in any of the Center's activities. (1) See the New York Times piece on Mr. Lykourezos (4 August 1996: ‘Greek Lawyer Pleased to Defend Bosnian Serb’, by Raymond Bonner), and a similar piece from the Washington Post (7 August 1996: ‘Athens Criminal Lawyer Wants to Defend Mladic’, by Jonathan C. Randal) . Mr. Lykourezos boasted that he would defend General Mladic pro bono, and that he considers him ‘more a friend’ than a potential client. (2) See the Dutch documentary in which Mr. Lykourezos questions Srebrenica genocide committed by Serb troops under the direction of General Mladic: Op z'n Grieks [The Greek Way], Director : Ingeborg Beugel, IKON, 2002; http://www.ikonrtv.nl/factor/index.asp?oId=402. I am Takis Michas, staff journalist of the Greek daily Eleftherotypia and a contributor to the Wall Street Journal Europe. I understand that the Woodrow Wilson Center will be organizing an event on the 15 of May in Athens to honor Mr Bartholomew and Mr Parakevaides. In this event Mr Alexandros Lycourezos will serve as the dinner chair. a) Were you aware of Mr. Lycourezos’s politics when you invited him to serve as the dinner chair in such an important event? b) Given that Mr Lycourezos has never said that he regretted his past statements in support of Mr Mladic, does your invitation to Mr Lycourezos also imply that the Woodrow Wilson Center endorses the war crimes committed by the Serb fugitive in Srebrenica and elsewhere? Reference your question about the Woodrow Wilson Center Awards and the dinner chairman for the event in Greece: The Woodrow Wilson International Center for Scholars, established by Congress in 1968 and headquartered in Washington, D.C., is the living, national memorial to President Wilson. The Center is a nonpartisan institution of advanced research, supported by public and private funds, engaged in the study of national and world affairs. The Center establishes and maintains a neutral forum for free, open, and informed dialogue on issues that affect our globalized societies. The Center's mission is to commemorate the ideals and concerns of Woodrow Wilson by providing a link between the world of ideas and the world of policy, by bringing a broad spectrum of individuals together to discuss important public policy issues, by serving to bridge cultures and viewpoints, and by seeking to find common ground. The Woodrow Wilson Awards are among the most prestigious given throughout the world and have been given internationally to leaders, entrepreneurs, peacekeepers, and policymakers, to show gratitude for the positive impact their accomplishments have had on our global culture. lawyer in Athens’, with a significant presence in Greek society and in that context he has been asked to chair and support this internationally acknowledged event in honor of the Ecumenical Patriarch and Mr Paraskevaides. We are pleased to have the benefit of his leadership, and both awardees are enthusiastic about his role in this event. Although we at the WWICS respect any and all opinions, the Center does not endorse any actions against the principles of freedom, justice and democracy. The Woodrow Wilson Center respects others’ opinions and personal choices, and it does not represent or endorse particular political views. Mr Lykourezos was not asked his political views when he was asked to be a dinner chairman for an event honoring two extraordinary individuals. The Center notes that Mr Lykourezos's views on the Bosnian crisis of the 1990s are views shared by much of the Greek population and that in fact he has indicated that he had no direct or indirect contact with General Mladic after 1997 or with Slobodan Milosevic after 2000. I have seen a copy of the reply you sent to the prominent Greek journalist Takis Michas, responding to his e-mail about your invitation of Mr Alexandros Lykourezos to your award ceremony on 15 May. I am surprised and disturbed by some of the things you say. You write that you are 'pleased to have the benefit of his [Mr Lykourezos's] leadership'; that you 'respect any and all opinions'; and at the same time, that 'the Center does not endorse any actions against the principles of freedom, justice and democracy'. Mr Lykourezos has publicly stated his warm feelings of personal friendship for a mass murderer, Ratko Mladic (see, for example, the New York Times, 4 August 1996); he has also publicly questioned the reality of the mass murder of 7,000 people which occurred at Srebrenica. That genocide did occur there has been established by an international court of justice. That Mladic was directly responsible for it is something for which the prima facie evidence is overwhelming - evidence which was in the public domain long before Mr Lykourezos expressed his friendly feelings for him in 1996. Your statement that you respect 'any and all opinions' is so general as to defy belief: it is just not credible, for example, that you would respect the opinions of a Holocaust denier, or of a person who expressed admiration for Hitler. You must surely set some limits of acceptability, and it is impossible to see why admiration for Mladic should fall within those limits. Your wording also suggests that you think you can make a neat distinction between 'opinions' and 'actions'; but what is at issue here is Mr Lykourezos's action of expressing his opinion. Mr Lykourezos's 'leadership', to which you refer, consists of his adoption of a prominent role on public issues, and the issue of Mladic is one of them. When he stood for election to the Greek Parliament, he included a photograph of himself and Mladic in his election materials. Is that really the sort of 'leadership' of which the Woodrow Wilson Center is 'pleased to have the benefit'? No less troubling is your statement that 'the Center notes that Mr Lykourezos' views on the Bosnian crisis of the 1990s are views shared by much of the Greek population'. I do not know whether this is a correct statement where his warm feelings for Ratko Mladic are concerned; but if it is, why do you suppose that the fact that extreme and offensive views are widely shared makes them unobjectionable? You say that 'Mr Lykourezos was not asked his political views when he was asked to be a dinner chairman.' You also say, however, that 'he has indicated that he had no direct or indirect contact with General Mladic after 1997 or with Slobodan Milosevic after 2000', which suggests that you did at least make subsequent inquiries. But if you thought it was relevant to make those inquiries, presumably on the grounds that a connection with Mladic could disqualify him from presiding at your ceremony, why do you think that these pieces of chronological information exonerate him? Would it not be more relevant to ask him at what date he publicly retracted, and apologised for, the warm feelings of friendship for Mladic which he expressed in 1996? And if the answer to that question is that he has never retracted or apologised for them, why should the mere fact that he has not recently had contact with Mladic make any difference? My impression is that you simply did not know the relevant facts about Mr Lykourezos when you invited him to take part in this event, and for that I do not blame you. But you surely know now. It is not too late for you to disinvite him, thereby saving the Woodrow Wilson Center from serious blame, and the damaging of its reputation in the eyes of many scholars and human rights activists around the world - to say nothing of many thousands of ordinary Bosnians, whose grief and suffering Mr Lykourezos has, in effect, so grossly insulted. I am writing to express my shock at the decision of the WWICS to invite Alexandros Lykourezos to chair its awards dinner on 15 May. 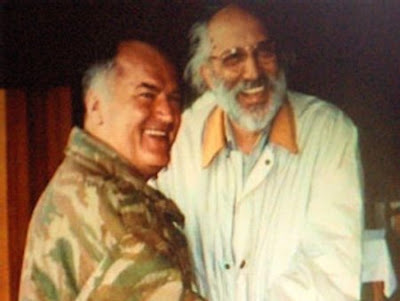 As you may be aware, Mr Lykourezos has openly spoken of his friendship with Ratko Mladic, a terrorist and war-criminal indicted for genocide by the UN's International Criminal Tribunal for the former Yugoslavia (ICTY). Mr Lykourezos has gone on record to deny that the Srebrenica massacre took place, although it has been recognised to have occurred, and to have been an act of genocide, by two international courts - the International Court of Justice and the ICTY. It is highly discrediting to the WWICS to be providing a platform to a friend of terrorism and genocide. I shall be writing to my colleagues among the international community of scholars of the Balkans and of genocide to make them aware of this outrage.